The Greater Toronto Area (GTA) is a metropolitan aurie in Canadae. At the 2011 census, the census metropolitan aurie haed a population o 5,583,064. 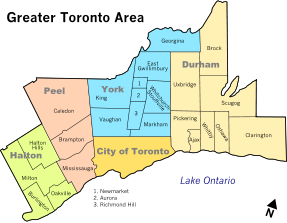 The Greater Toronto Area is defined as the central ceety o Toronto, an the fower regional municipalities that surroond it: Durham, Halton, Peel, an York. The Greater Toronto Area is different frae the Census Metropolitan Area of Toronto, which covers a smawer region. As o early 21st century, the regional span o the Greater Toronto Area is whiles extendit tae include the ceety o Hamilton, Ontario an its surroondin region, tae form the Greater Toronto and Hamilton Area, an urban aurie that haes a tot population rankit near the tap 50 in the warld.